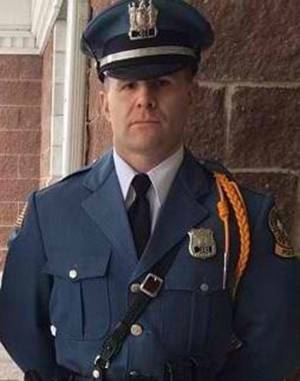 Add a video for "Hey Buddy"
This hero workout is dedicated to Patrolman Christopher Mark Goodell of Waldwick, NJ, who died on July 17, 2014, due to a collision between a truck and his stationary unmarked police car. A New Jersey native, and a lifelong resident of Waldwick, Chris graduated from Waldwick High School in 2000 and attended one semester at William Paterson University. In response to the September 11 attacks, he enlisted in the United States Marine Corps Chris served his country proudly for the next five years as a C-130 navigator, participating in Operation Iraqi Freedom. During his service, he achieved the rank of Sergeant and continued in the Marine Corps reserves for three additional years. Chris then went on to serve the residents of his hometown of Waldwick as a Police Officer for the next six years. Chris truly loved his job and served the community with dedication and devotion. Chris was engaged to be married to Jillian Voss and they were planning a 2016 wedding. Surviving is his father, Mark E. Goodell and his partner Jamie Brezinski and family, his mother Patricia J. (nee Flynn) Goodell and her partner Harold Pahlck and family, all from Waldwick, his sister Nicole and husband Daniel Priestner and his niece and nephew, Patricia Dille and Brian Priestner of Midland Park, and his fiancée, Jillian Voss of Waldwick. In addition, he will be truly missed by his extended family, David, Nancy, Connor, a sergeant in the United States Army, and Layne Voss of Waldwick, and his many aunts, uncles, cousins, and friends. Chris' badge number was 38, hence the 38 total repetitions per round (10/10/10/8). The 5 rounds represent the 5 years he served as an officer. Chris specifically liked running and bodyweight movements. "Hey Buddy" was Chris' signature greeting.